Chrysler is recalling certain Dodge Ram 1500 trucks equipped with faulty parking brakes, because they may pose a rollaway risk. Affected by the recall are approximately 9,300 model year 2013 Dodge Ram 1500 pickup trucks, which may be equipped with defective parking brakes. According to Chrysler, the parking brake equalizer may have been incorrectly adjusted, thus reducing its holding power. As a result, unintended vehicle movement may occur if parked on a slope. An important cable located in the parking brake, the equalizer works by connecting the single cable leading from the cab to the undercarriage to two separate cables linked to the individual tires. This connection allows for even distribution when the parking brake is employed. The recall covers 6,574 Dodge Ram 1500 pickups in the United States and 2,431 in Canada. The vehicles in question were manufactured from Dec. 17 through Jan. 22 at the Warren Truck Assembly Plant in Warren, Michigan. The Auburn Hills-based automaker is aware of six field reports of parking brake issues, but indicates that no crashes or injuries have been reported. An accountant auditing at Chrysler’s Warren Plant discovered the problem. Chrysler will begin notifying customers of the recall on April 12. Authorized dealers will inspect and, if necessary, re-adjust the parking brake equalizer at no cost to the owner. In the meantime, customers may contact Chrysler at 1-800-247-9753. Concerned drivers may also contact the National Highway Traffic Safety Administration’s Vehicle Safety Hotline at 1-888-327-4236 or visit www.safercar.gov. Chrysler’s recall of the 2013 Dodge Ram 1500 is one of six recalls issued by the Auburn Hills-based automaker on Tuesday. The recalls address multiple safety concerns like malfunctioning airbags, fuel tank issues and broken drive shafts. In total, the six recalls impact roughly 260,000 cars, trucks and SUVs. 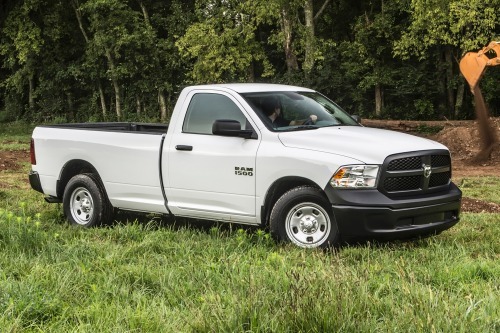 Select Dodge Ram 1500 pickup trucks were recalled earlier this year as part of a massive recall to address a rear axle problem. The February recall impacted 360,000 model year 2009 Dodge Durango and Chrysler Aspen SUVs, 2009-2011 Dodge Dakota and 2009-2012 Dodge Ram 1500 pickups. Affected trucks and SUVs may be equipped with a defective rear axle pinion nuts, which may loosen due to a missing adhesive patch. As a result, the axle may seize up and cause loss of vehicle control. In some cases, the sudden loss of vehicle control may result in a crash. The recall was an expansion of an October 2012 recall that involved covered 44,000 model year 2009-2010 Dodge Dakota and Ram 1500 pickup trucks. Chrysler received 15 reports of accidents pertaining to the rear axle problem.